Ahead of the first game of their 2017-18 postseason, the Prince Albert Northern Bears received several awards to honour their achievements through this year’s Saskatchewan Female Midget AAA Hockey League season. 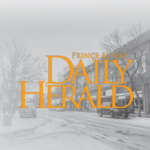 The awards were presented by Barry Schrader on the evening of Feb. 26, before the Bears faced off against the Battlefords Sharks for their round 1 playoff game. Schrader is the Saskatchewan Hockey Association coordinator for female officials. 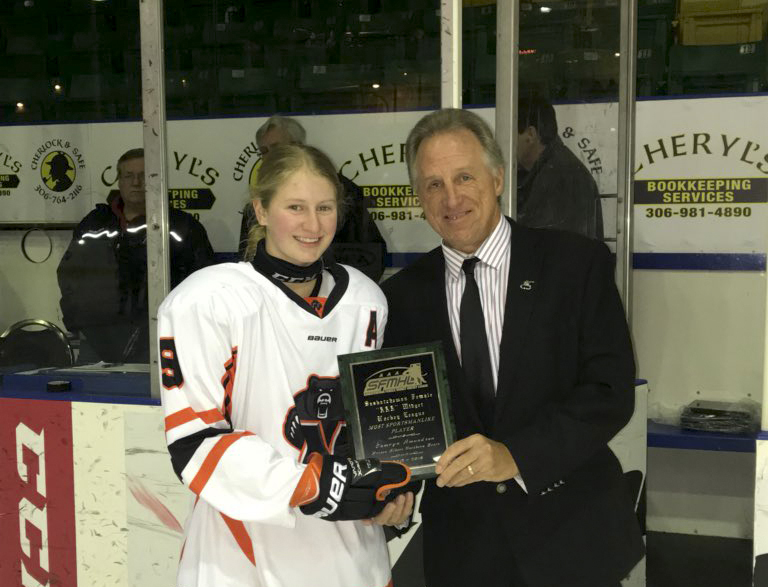 Forward Camryn Amundson won the Most Sportsmanlike Player of the Year award. Through 28 regular season games played this year, Amundson had 11 goals, 14 assists and 25 points, while tallying only six penalty minutes. That ranks her outside of the top 100 players in the league with the most penalty minutes. Fellow teammates Hannah Koroll, Kate Ball and Abby Soyko were voted on to the SHA 2nd-team all-stars for year. The Bears skaters notched 17, 25 and 38 points, respectively, on the year. Meanwhile, Bears head coach Jeff Willoughby won the Coach of the Year award. One year after guiding the P.A. 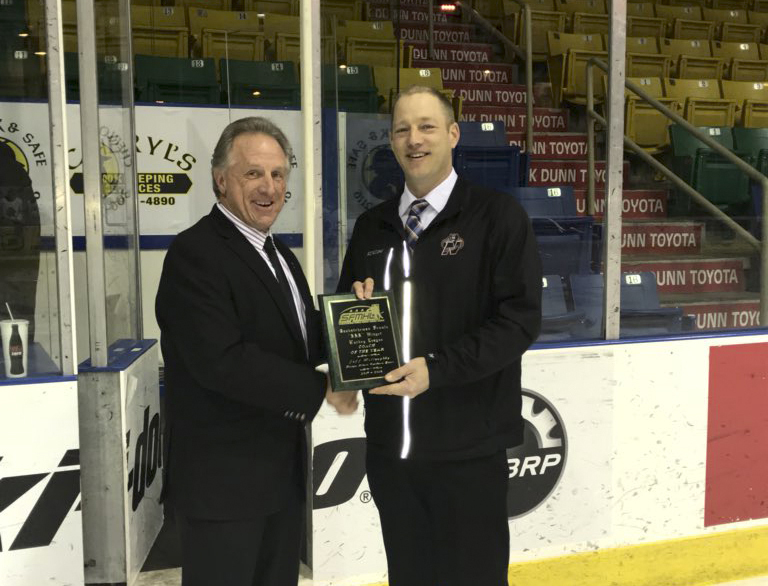 club to a provincial championship, a western Canada regional championship and a national Esso Cup berth, the Bears bench boss guided the team to a second-place finish this year. The Bears capped off their regular season with 22 total wins and six total losses though 28 games. Throughout the season, Willoughby and his coaching staff used a balanced mix of line combinations and defensive pairings to find success; they often relied on groups of players – rather than individual standout stars – to carry the load for the team and power it to wins. 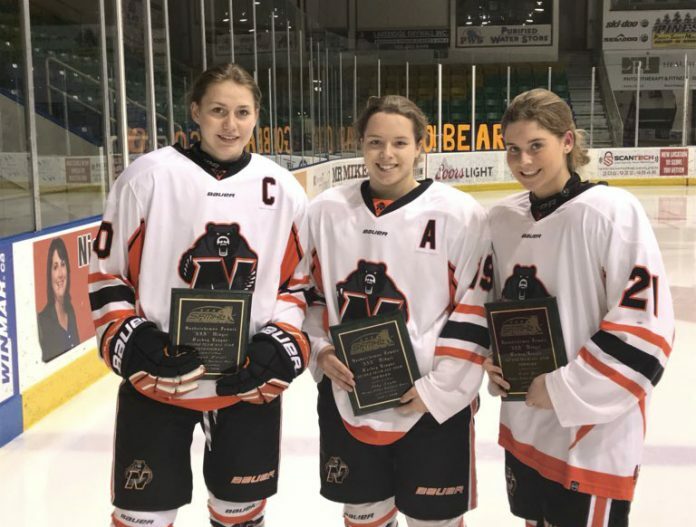 For example, every Bears skater except for Colby Donald and goalies Ryan Fontaine and Lexi Beuker scored at least one goal this year; every Bears skater except for the two goalies had at least two points this year; and 12 of 18 Bears skaters scored 10 or more points this year, including rookie Kailee Peppler.